A series of changes in recent years in the way newspapers count their subscribers masks a deep, ongoing and troubling plunge that has cut print circulation by 41.6% at the nation’s biggest papers since 2005. Print matters because it still produces approximately three-quarters of the revenues at the typical newspaper, according to Jim Conaghan, the vice president of research at the Newspaper Association of America, an industry-funded trade group. Although most publishers say they are moving aggressively to diversify their revenues away from print by creating digital products and services, the typical newspaper depends on print advertising and circulation fees to not only fund the innovations they hope will secure the future of their franchises but also to stay afloat in the meantime. While the Alliance for Audited Media reported Tuesday that combined print and digital circulation at newspapers in the last six months fell by 0.7% on weekdays, print-only circulation actually declined by 9.9% in the same period at the 25 largest papers in the country. The AAM is an industry-funded group formerly known as the Audit Bureau of Circulations. The long-term circulation trend is sobering. The AAM archives show that weekday print circulation at the top 25 papers has plunged 41.6% since March, 2005, the year the industry achieved all-time high advertising sales of $49.4 billion. In a stunning reversal of fortune that has roiled the industry ever since, ad sales in 2006 commenced a seven-year slide that brought aggregate industry revenues to $22.3 billion by the end of 2012. 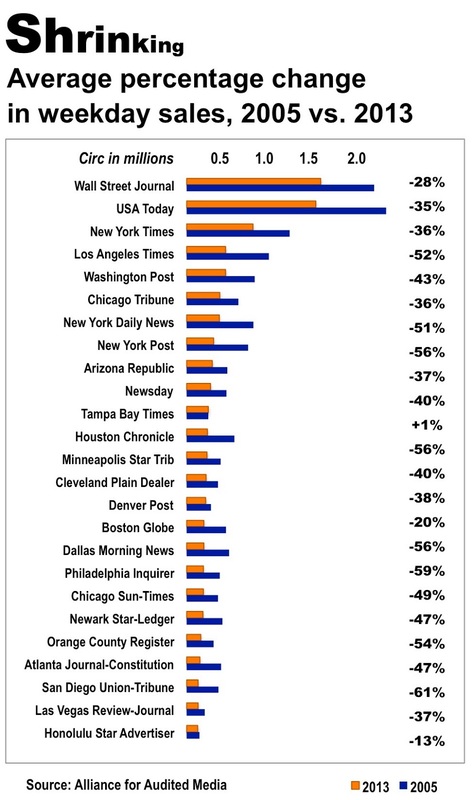 As illustrated below, weekday print circulation in the last seven years has fallen by more than half at the Los Angeles Times, New York Daily News, New York Post, Arizona Republic, Houston Chronicle, Boston Globe, Dallas Morning News, Newark Star-Ledger, Orange Country Register, Atlanta Journal-Constitution and San Diego Union-Tribune. Only one of the 25 papers on the list reported selling more print copies in 2013 than in 2005: The Tampa Bay Times. Thus, the 25 titles that collectively sold 15.1 million papers on the average weekday in 2005 sold only 8.8 million papers on the average weekday in 2013. In fairness, some of the circulation decline results from decisions by publishers to stop selling promotional subscriptions at heavy discounts and to discontinue the costly practice of shipping papers to locales outside their primary markets. It also is fair to note that circulation may have been more stable in the last seven years in small- and medium-sized markets than among the metros on the list of the top 25 properties. At the same time circulation has been contracting, it has become increasingly difficult to track the trends, because the previously simple and uniform metrics employed by publishers have been replaced in recent years by a series of complex rules that now make it possible for publishers to include far more products than paid print papers in their circulation tallies. In addition to paid print newspapers, publishers today can count digital subscriptions and even free products that deliver preprint advertising to the homes of consumers who don’t happen to buy the newspaper. The positive side of the new rules is that they allow publishers to fully portray the breadth of their audiences, as they endeavor to make their content available in free print products, on the web, on mobile platforms and in the social media. But the flip side of the latitude afforded publishers is that the new methodology can lead to incongruous, if not to say unbelievable, outcomes. When it comes to selling the print newspapers that generate the bulk of advertising and circulation revenues, the Tribune swamped the Sun-Times with weekday circulation of 368,145 vs. 184,801. On Sunday, the day of the week that typically generates 50% or more of a newspaper’s revenues and profits, the Tribune’s average circulation was 706,840 papers a week vs. 186,182 for the Sun-Times. Which paper looks bigger now? A close look at the data shows the Sun-Times pulled ahead of the Tribune by legitimately counting the 208,087 newspapers in publishes in suburbs around Chicago. But the Tribune, which publishes hundreds of thousands of sister titles of its own, does not include their circulation in its publisher statement. The disparity in reporting practices forces an advertiser to parse through the conflicting data to understand the dynamics of the market. Is confusion the outcome the industry desires? Among the other anomalies on the list of the 25 largest papers published by AAM, the Honolulu Star-Advertiser, which has a print circulation of 125,726, is listed as being larger than the San Diego Union-Tribune (print circ: 192,782), Boston Globe (print circ: 172,048) and Atlanta Journal-Constitution (print circ: 149,523). Once again, the question arises: What is the relative value of the products that put the Honolulu paper ahead of the papers in the much larger markets? Because there is no unanimity in the way publishers report circulation, some newspapers can count the same individual twice if her print subscription is bundled with digital access. How can an advertiser tell if someone is double-counted? In the future, as noted here by Rick Edmonds at the Poynter Institute, publishers will have even more latitude in counting noses by cherry-picking the days of the week they report circulation. Will increasingly idiosyncratic circulation data help – or turn off – advertisers? With print circulation flagging and digital products evolving, it is understandable why publishers want – and need – flexibility in the way they report the size and nature of their audiences to advertisers. But the anything-goes approach to circulation metrics – which raises more questions than they answer – seems to be a counterproductive path to achieving the objective. If credibility is a critical factor in building confidence among advertisers, why is the industry producing such confounding data? There's another question on digital editions. At least in the Twin Cities, where I live, "digital replica" editions account for more than 70% of the digital editions circulated by both the Star Tribune and the Pioneer Press. I don't have any way to prove this, but I suspect that digital replica editions are more likely to appeal to older readers, who want the convenience of reading online but the familiarity of the print layout they're accustomed to. So if the vast majority of digital editions are being consumed by the gray-haired demographic, that doesn't really move the digital needle in the direction it needs to go. I'm also keenly interested in your question about double-counting print and digital subs. I still get the Star Tribune in print 7 days a week. That entitles me to digital access as well. Are they double-counting me? AAM is not above criticism. Fair enough. But you are wrong when you claim publishers will be able to "cherry pick" which days they report circulation. If a proposed rule change goes through this year, publishers will still be required to report circulation for each day of the week. They will simply cease reporting a five-day weekday average. AAM has advertisers on its board of directors too. Instead of guessing or speculating, please ask the advertisers if they consider a paid digital replica subscription equivalent to a paid print subscription. If not, why not? And, are they equivalent to a paid online visitor? If not, why not? Or, is everyone guessing? Has anyone done any readership research on the differences (if any) between reading a digital replica verses a printed version of the same newspaper? Both editions have active involved readers paying to read the newspaper’s content. I think it is time to get beyond the metrics and statistics for the print biz model. It still represents the lion's share of the revenue pie, but not for long. The hand writing has been on the wall for a sufficient period of time. Cut print runs to several days per week with an exit plan. Investment in investigative reporting is now as important as tech investment for business continuity. Focus on eliminating the competition for ad dollars swiftly through acquisition or other means versus trying to outsell or out-compete. If you can't do this, you need an exit plan. The print edition will survive for some number of years, but those years are numbered. Likewise, the digital edition will survive for some number of years. We should all stop consternating over this and get on with the business at hand: delivering news and making a living at doing just that. The original formula for that still works: who, what, when, where, why. @reinan--- The AAM audits newspapers that are interested in participating. Most respectable if not all medium and large newspapers are participating. These audits are shared upon request. Within the audit documentation the delivery types such as digital, web and home delivery are counted separately. I recommend that you call the newspaper in your area and ask for a copy of the MMA audit formerly known as the ABC Audit. @Bruce Wood--- Mr. Wood, research is ongoing and done by Scarborough Research and the Newspaper Association of America, the research is compiled every six months and used daily by management and sales executives at newspaper in which I work. These extensive surveys are completed via written and phone interviews of readers and non-readers alike. When I count today's copy in my AAM record book for a 7-day subscriber, no problem. This afternoon that same subscriber buys a single copy because she wants extra coupons, extra copies of her son's graduation photo on page 6A, or her husband took their copy to work. I can legitimately count that as circulation copy #2. Both copies qualify, both copies count. So what's the problem, then, with qualifying any digital editions as legit circulation u its? I think what may help is this. Circulation is circulation. But audience is a different matter. Let's not make circulation into something it's not. "Is confusion the outcome the industry desires?" Of course it is - assuming good faith in the industry's "convenient" redefinition of metrics makes about as much sense as assuming good faith in newspapers' political coverage. In both cases, newspapers are all about skullf*cking (manipulating) the public. In other words, things are not much different from the last 60 years (except the internet has smashed their monopoly over the megaphone and their unfettered ability to occupy the territory between our ears).